This is what's happening in my office (or out through the window) right now. If the web-cam is working you should see a live image updated every 60 seconds. Otherwise you get the last image the web-cam recorded. There's a time-stamp in the corner so you can see if it's updating. If you see something other than my desk, then, duh, I've got the camera pointed somewhere else! If you find the live pictures of me in my office interesting for more than a moment or two, then unless you are a member of my immediate family you probably need help. 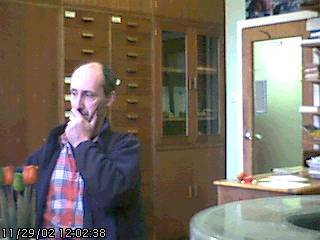 There are a few old pictures from the web-cam here, which might help you to work out what the camera is pointing at now if it isn't immediately self-evident.